What is a Massachusetts Month to Month Lease Agreement? Massachusetts Month to Month Lease Agreement: What Is It? In Massachusetts, a month to month lease agreement is a document that allows landlords and tenants only commit to a lease for a period of one month. 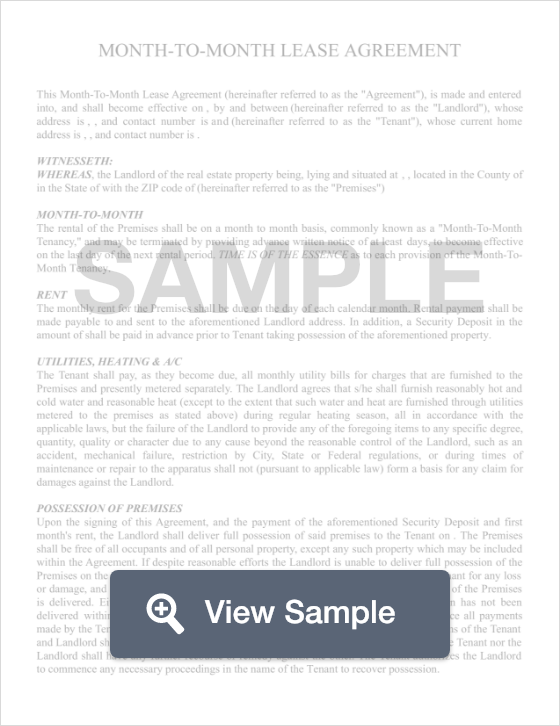 In these agreements, the terms of the contract are defined just like a long-term lease. These terms include when rent is due, how much is to be paid, where rent is to be paid, as well as the rules of occupancy. Month to month agreements often work well for both the landlord and the tenant because of the flexibility. For landlords, a month to month lease is great if they-re only looking to lease a property for a short period of time, or if they are leery about new tenants. For tenants, a month to month lease agreement is great if the tenant is only looking to stay in the rental for a short period of time perhaps because of a job, or are in between houses. A month to month agreement holds the same legalities as a long-term agreement, and if terminated, must be done in writing at least 30 days before the effective date. In the state of Massachusetts, a tenancy at will, or month to month lease agreement must be terminated by a written notice no less than 30 days before the effective termination date.